There's one way out of this. And by "out", I mean saving some semblance of golden, emotionless face. In two weeks time, the Academy of Motion Picture Arts and Sciences will dole out their stash of shiny bald dudes, but Ben Affleck is only eligible to carry one out of the Dolby Theatre, not his now customary pair of trophies. I'm guessing you're aware the Academy didn't deem Affleck worthy of a Best Director nomination for his Iran-hostage thriller Argo – an omission that led me to unleash this rant on-air. That reaction seems rather tame considering what's gone down over the past month. January 10th, in a Santa Monica airplane hangar, Affleck won both best picture and best director from the voting block I belong to: the Broadcast Film Critics Association. Three nights later at the Beverly Hilton, the 40-year-old scored the Golden Globes' top two prizes, best drama and best director. And Argo closed out the month with the Producer Guild's top feature award and SAG's Outstanding Ensemble award. Four-for-four, for those of you keeping score. As February began, the Academy suffered the most damning of Affleck's distinctions: the Directors Guild of America - comprised solely of folks who construct films and TV shows - handed the Boston native their mammoth medallion for his exquisite behind-the-cam effort. 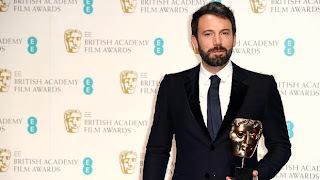 And just last night, the British Academy of Film and Television Arts, BAFTA, bestowed both best picture and best director upon Affleck as the Argo steamroller made it a clean sweep, six-for-six. So how do the 5,800-ish members of the Academy right their monumentally embarrassing wrong? The only thing they can do: Make certain Argo wins its Best Picture trophy. While that may sound like a gift rather than something earned, there are six major awards groups that strongly suggest otherwise. Those six governing bodies' accolades serve as a facial that Affleck can take solace in regardless of what transpires February 24th.